Tanner Korotkin and Analyze This. Photo Credit ©AnneGittinsPhotography. Wellington, FL – May 16, 2018 – The ESP Spring Series concluded on Sunday, May 13, at Equestrian Village at Palm Beach International Equestrian Center (PBIEC), with a victory for Tanner Korotkin of Wellington, FL and Kimberly Jakubowski’s Analyze This in the $10,000 Open Stake. Korotkin and his mount crossed through jump-off timers in 41.641 seconds, taking ownership of the Jamie Morillo (ECU) designed course ahead of 18 other horse-and-rider combinations. Reserve placing went to German Camargo of Loxahatchee, FL and his own Centurio, who passed over the fast track in 42.977 seconds. Third place was rounded out by Nataly Leibovitz of Wellington, FL and her own Freaky Friday, riding to a jump-off time of 44.658 seconds, with four added faults. The $1,500 NAL Child/Adult Jumper Classic saw Elizabeth Ecclestone of Aspen, CO and Believe, owned by SF Equestrian Investments, ride to victory, as they finished the jump-off time in 35.674 seconds. Emilio Mantero of Miami, FL and Ideale By Marstyl, owned by Mantero, finished in second place with a time of 37.829 seconds and four faults, ahead of Sara Williamson of Wellington, FL and Den Dekker, owned by Ossian Ventures LLC, who finished third, and dropped a rail to add four faults to their time of 38.407 seconds. The $2,500 NAL Low Junior/Amateur Owner Jumper Stake was championed by Dana Ventrice of Pompano Beach, FL and Dollard Jessy Stable, owned by Ventrice, who topped the class with a time of 33.895 seconds. Laurie Sharma of Wellington, FL and her own Equine Couture’s Jolie collected second place with a time of 34.722 seconds, while Tanner Korotkin of Wellington, FL and Fairtrade VD Hazelhof, owned by Eagle Valley Partners, LLC, took third place with a jump-off time of 36.391seconds. Ideal One, owned by Linda Smith-Faver, and Annie Soper of West Palm Beach, FL took home championship honors in the Wanderers Club Children’s Pony Hunter Division, while Kara Jones of Wellington, FL and her own Happily Ever Laughter took home the division’s reserve champion awards. Ella Bostwick of Wellington, FL and Fariella FLF, owned by Linda Sommers, topped the UHealth Children’s/Adult Hunter Division, after a weekend of strong performances. Reserve champion honors were awarded to Rather Clever, owned by Staci Rosner and shown by Aspen Gaffey of Boca Raton, FL. Carlson 55, owned by Sarah Chatfield and ridden by Caitlin Houlihan of Scottsdale, AZ took home champion honors in the USHJA Hunter 2′ & 2’3″ Division, while Jane Herman of Stuart, FL and her own As You Wish were presented with reserve champion honors. Anna Toha of Boca Raton, FL and Snowcap, owned by Megan Wessinger, captured top honors in the Walk/Trot Division, while Maxima Lanasa and Happy Daze, owned by Michelle Moen, were presented with the division’s reserve championship honors. The Amateur Owner Hunter 3’3″ & 3’6″ Division saw Christina Plichta of Wellington, FL and Kingsford, owned by Purple Lane Farm, LLC, were victorious in the division, taking champion honors. Plichta also took reserve champion honors aboard Purple Lane Farm, LLC’s Rightfully So. The Pilates Rocks Low Child/Adult Hunter Division saw Lyda Denney of Wellington, FL and her own Lubeck take the divisional championship ahead of Cornelia Rutledge of Bethesda, MD and Heathfield Hunters LLC’s The Golden Compass, who finished in reserve. The 17 and Under Equitation Division saw Erin Ecclestone of North Palm Beach, FL guide Cento For Ever, owned by Castlewood Farm Inc, to top honors after their consistent performances throughout the week. Annie Soper of West Palm Beach, FL and Linda Smith-Faver’s Ideal One rode to reserve. Todd Minikus and Amex Z. Photo Credit ©AnneGittinsPhotography. Wellington, FL – April 18, 2018 – Todd Minikus of Lake Worth, FL welcomed another successful week of competition during the second installment of the ESP Spring Series at the Palm Beach International Equestrian Center (PBIEC) in Wellington, FL after taking a first-place finish in the $35,000 ProElite® Grand Prix last week. Minikus once again piloted the Quality Group owned Quality Girl to the blue ribbon in the $25,000 ESP Spring II Grand Prix, after a speedy run around the fast track, designed by Anna Catalina Cruz of Mexico in 35.281 seconds, before taking the $35,000 ESP Spring II Grand Prix aboard Amex Z.
Minikus brought his A-game once again, capturing his third Grand Prix win of the ESP Spring Series. The duo bested the class of 36 horse-and-rider combinations, finishing out ahead with a final jump-off time of 32.929 seconds. Margie Engle trailed just behind after crossing through the timers in 36.23 seconds on her seasoned mount Indigo, owned by Gladewinds Farm Inc., Griese, Garber, and Hidden Creek. Third place went to Celso Ariani of Wellington, FL and Ukulman de la Nutria, owned by Ricardo Romero, after stopping the jump-off clock in 37.619 seconds. It was a “girls’ day” no doubt in the $25,000 ESP Spring II Grand Prix on Friday, April 13. After Minikus secured first aboard Quality Girl, Michelle Guardino’s Fancy Girl was ridden to the second-place position with Willie Tynan of Wellington, FL after finishing the jump-track in 38.86 seconds. Margie Engle of Wellington, FL rode Bockmanns Lazio, owned by Gladewinds Farm Inc., to third place in a swift 36.239 seconds, but ended the second round with four jump faults. The $10,000 Open Welcome Stake was another successful ride for Emanuel Andrade of Wellington, FL and his own Jenni’s Chance, who raced to the win in 33.219 seconds. Todd Minikus of Lake Worth, FL and Chris Brem’s Amex Z kicked off their week with the second-place finish, crossing through jump-off timers in 34.174 seconds. Alexis Trosch of Wellington, FL and her own Cantara Z rounded out the top three in 34.865 seconds. The $5,000 Omega Alpha 1.35m Open Stake saw Todd Minikus of Lake Worth, FL and Lord Calador, owned by Melissa Bilodeau, take top honors after stopping the jump-off timers in 32.779 seconds. Abigail McArdle of Barrington, IL and Chuck Berry 8, owned by Plain Bay Sales, captured second place with a time of 33.483, ahead of Peter Lutz of Waccabuc, NY aboard Camillo VDL, owned by E2 Show Jumpers, with a time of 34.224 seconds. The $1,500 NAL Children’s/Adult Jumper Classic awarded the win to Jorge Gomez of Loxahatchee, FL and his own Dallas de la Bonnett, with a jump-off time of 26.586 seconds. Avery-Anna Hogan of Wellington, FL and Eurocommerce Tampa, owned by Hogan, were presented with second place after completing the track in 27.406 seconds. Hogan also placed third with her own Zenith Z collected third place in the class with a jump-off time of 28.91 seconds. Stephanie Nell of New Fairfield, CT was the winner of the $1,5000 Low Adult Jumper Classic riding Cash Advance, owned by Julian Cournane, who completed their jump-off time in 42.446 seconds. The red ribbon was awarded to Lauren Bardy of West Bloomfield, MI and Epic, owned by Leslie Howard and Uri Burstein, after completing their round in 47.093 seconds. Cynthia Screnci of Boca Raton, FL and Vichy, owned by Volado Farms, rounded out the top three, achieving a jump-off time of 39.39 seconds but with four added faults. Charlotte Matthews of Bayville, NY and Sagamore Farms-owned Tinto des Contes topped the $1,500 Low Children’s Jumper Classic after securing the win with a jump-off time of 40.824 seconds. Kayla Walker of Jamaica Plain, MA and River Run Farm LLC’s Middlemarch finished in second place with a jump-off time of 42.132 seconds, ahead of Stephanie Garrett of New York, NY and Westwind Equestrian’s Dusty S Z, who completed the track in 42.143 seconds. Victory in the $1,500 M&S Child/Adult Jumper Classic was awarded to Allyson Blais of Boynton Beach, FL riding LandaniMA, owned by Blais, after completing the jump-off in 37.24 seconds. Second place was awarded to Stacey Mahoney of New York, NY and Charisma Blue, owned by Mahoney, riding to a time of 38.75 seconds. Third place honors were presented to Kyle Olson of Pawling, NY and Wilhelmina who passed through timers in 38.769 seconds. Victoria Colvin of Loxahatchee, FL and Sarah Cressy’s Delft Blue championed Friday’s $5,000 USHJA National Hunter Derby, landing on a final score of 175. Samantha Senft of Wellington, FL and Carson Cavalline’s Blueberryhill’s Blue Dream rode to second place honors, while Sara Ballinger of Marion, OH and her own Wanderprinz rounded out third place with a 158.5. Ellen Toon of South Salem, NY rode Mirror Image to champion honors in the Amateur Owner Hunter 3’6″ division, while reserve honors were awarded to Laura Sexton of Greenwich, CT and Set To Music, owned by Sexton. Debi Maloney of Honeoye Falls, NY aboard Fortitude, owned by Maloney and Sarah Cressy, secured champion honors in the Adult Amateur Hunter Division, ahead of Christina Plichta of Wellington, FL aboard her Rightfully So, owned by Purple Lane Farm, LLC. Sam Walker of Nobleton, ON and Broadway, owned by Carol Ruth and Sumner Hill Farms LLC, took champion accolades in the #1 Education Place Junior Hunter 3’6″ Division. Reserve champion was awarded to Jordan Allen of West Bloomfield, MI and Eclypse, owned by Holly Orlando. The Modified Hunter Division saw Anabella Cottone of Davie, FL and her own Aurora take champion honors for their performances throughout the week, while reserve champion was presented to Alliyah Antoniadis of Middletown, NY and True Colors, owned by Joe White. The Walk/Trot Division saw Caitlin Sweeney of Oyster Bay, NY and Golden Ticket, owned by Cheryl Amaral-McKee, ride to the division’s top honors ahead of Madison Chouinard and Persnickety, owned by Hannah Randolph, who finished with reserve champion honors. Lainie Wimberly of Ridgefield, CT captured a tricolor ribbon, aboard For Freedom, owned by Laurie Stevens, in the USHJA Hunter 3′ Division. Wimberly and Santiago, owned by Stevens, finished as reserve champions. The USHJA Hunter 2′-2’3″ Division saw Maggie Gould of Wellington, FL riding Masterpiece, owned by Alexandra Raffy, collect the division’s champion honors. Reserve champion went to Stacey Shore Werner of Jupiter, FL and her own Sebastian. Ella Bostwick of Wellington, FL and Soffia Cady’s Royal Classic finished atop the Score at the Top Large Pony Hunter Division, earning champion, while reserve champion was awarded to Kierstin Antoniadis of Middletown, NY and California Dreamin’, owned by Millennium Farm, INC.
Roberto Teran, Jr. and Il Rubacouri. Photo ©AnneGittinsPhotography. Wellington, FL – April 26, 2017 – Roberto Teran, Jr. of Wellington, FL and Il Rubacouri earned top honors in the $25,000 Accuhorsemat Grand Prix at ESP Spring III hosted at the Palm Beach International Equestrian Center (PBIEC). The pair dashed through the jump-off timers in 34.56 seconds to take the lead ahead of Emanuel Andrade and Boy IV, who took second place with a time of 34.788 seconds. Andrade also guided Bon Jovi to a top three finish, stopping the timers in 35.962 seconds for third. “He’s a horse that was born in Italy. I own him with Juan Carlos Garcia who is a top international rider from Colombia based in Italy. He’s a very careful, fast horse. We’re trying to move him up into the bigger grand prix classes. He was jumping CSI 2* and 3* classes in Europe before coming here,” he explained. “He’s been fantastic. He did a few big classes during the WEF circuit, including few Saturday nights. He’s a nine-year-old that is going to be very promising for the future,” commented Teran, Jr.
Samuel Parot of Wellington, FL and his own Taalex rode to victory in the $10,000 Equiline Open Stake during ESP Spring III, taking the class with a jump-off time of 35.876 seconds. Emanuel Andrade of Wellington, FL and his own Cortina 186 followed in second place, finishing just a second behind Parot, crossing through the timers in 36.434 seconds. Alex Granato of Wellington, FL and Beorn, owned by Alliy Moyer, collected third place with a time of 36.843 seconds. Shane Sweetnam of Wellington, FL and Samoa, owned by Anna Beth Athey, captured top honors in the $5,000 Omega Alpha 1.35m Stake, besting a class of 43 entries. The pair stopped the jump-off timers in 29.417 seconds to take the win ahead of Jimmy Torano of Wellington, FL and Diamant des Biez, owned by E2 Stabes, who finished with a time of 29.675 seconds. Sweetnam also guided Le Vio, owned by Gut Einhaus, LLC, to third place with a time of 29.903 seconds. Ty Simpson of Wellington, FL and Why Not, owned by Simpson Show Jumping, Inc., rode to victory in the $1,500 NAL Child/Adult Jumper Classic, besting Michelle Carnes and Ushuaia, owned by Howard Lemus, as the only two pairs to advance to the jump-off round. Marlee Malamut of Vallaway, NJ and Cody, took third place after accumulating three time faults on the first round track. Lydia Ulrich of Rochester, NY and Up Stream, owned by Beth Congel-Ulrich, topped the $2,500 Gold Coast Feed Low Junior/Amateur Owner Classic with a jump-off time of 29.173 seconds. Ashley Vogel of Mequon, WI and Twist des Forets, owned by Neil Jones Equestrian Inc., earned second place with a jump-off time of 31.156 seconds. Sophia Studd of Wellington, FL and her own Angelica Bird rounded out the top three with a time of 32. 635 seconds. Meghan Kaupp of Pittsford, NY and Montenegro, owned by Lilly Ulrich, rode to victory in the $5,000 USHJA National Hunter Derby, amassing a two round score of 176. Zayna Rizvi of Greenwich, CT and Verdana, owned by Laura Wasserman, earned second place with a score of 171, while Victoria Colvin of Loxahatchee, FL and Easton’s Rocket, owned Pamela Landis, took third place with a score of 170. Kaitlin Porath of Charlotte, NC guided her own Breaux to top honors in the Amateur Owner Hunter 3’3″ 18-35 Division, while Brittan Bailey of West Palm Beach, FL and Jackman, owned by Bailey Mews, LLC, who were awarded with reserve champion. The #1 Education Place Junior Hunter 3’3″ Division was championed by Adam Edgar of Leesburg, VA and Carasco, owned by Bill Schaub, while Zayna Rizvi of Greenwich, CT and Verdana, owned by Laura Wasserman, were presented with reserve champion. Molly Sewell of Winter Park, FL and Quillaja, owned by Robert Scott, collection the division championship in the Neue Schule Bits USHJA Hunter 3′ Division. Mavis Spencer of Santa Monica, CA and Prophet, owned by Neil Jones Equestrian Inc., earned reserve in the division. Alex Elle Lignelli of New York, NY and her own Iparty finished atop the division in the Small Pony Hunter after several strong performances. Lauren Gee of Valdosta, GA and Grand Slam, owned by Sweet Oak Farm, collected reserve champion. The Low Children’s Hunter Division saw Reese Madden of Southwest Ranches, FL and Diamond in the Sky ride to earn champion honors ahead of Isabel Beltran and her own Alleala, who finished in reserve. Michael Desiderio of Wellington, FL and Zero Tolerance, owned by Dru Cederberg, finished as champions in the Neue Schule Bits ESP Open Hunter 3’3″ Division. Mavis Spencer of Santa Monica, CA and Sidarta, owned by Two Swans Farm, finished with the reserve champion title. For more information on PBIEC and to see a full list of results, please visit www.pbiec.com. Gustavo Prato and Carna Z with ringmaster Steve Rector. Photo Credit ©AnneGittinsPhotography. Wellington, FL – April 16, 2017 – Gustavo Prato of Wellington, FL and Carna Z took top honors in the $35,000 Neue Schule Bits Grand Prix at ESP Spring II hosted at Palm Beach International Equestrian Center (PBIEC), after tripping the jump-off timers in 33.596 seconds. Ailish Cunniffe of South Salem, NY and Baloucento 2 captured second place with a jump-off time of 34.44 seconds ahead of Emanuel Andrade of Wellington, FL and U, who narrowly missed second place and finished with a time of 34.769 seconds. Prato and Carna Z, a 2005 Zangersheide mare (Crown Z x Gannus) owned by Equus Forte LLC, bested the class, which saw 19 combinations test the track designed by Ana Catalina Harris Cruz (MEX). Eight pairs advanced to the short course, while five finished with a double clear effort on the day. Prato and Carna Z went second in the jump-off and set a quick pace that was unbeatable. The duo has been working their way up through the levels over the course of the past year and 2017 was a break out season, as they continued to solidify their partnership. While going into the short course with a forward-thinking plan, Prato was aware that he would need to complete a round that would be difficult to beat for the combinations coming behind them. The mare, who has exceled at the larger heights this season with Prato guiding from the irons, is naturally fast, which Prato believes played a significant role in their win. “I think she is just really fast all over the place. You can turn, you can leave the strides out. When it comes to speed it’s very easy for her. As long as you leave the jumps up, you know you’re going to be there time-wise,” he commented. Prato and Carna Z earned a lot of “firsts” this season during the Winter Equestrian Festival (WEF) including their first FEI Nations’ Cup appearance and several successful outings during the popular “Saturday Night Lights” classes hosted each Saturday during the circuit. “I thought that this winter season was great because when I got her a little bit over a year ago, she was only doing 1.30 and 1.35m. We started to improve together and even did the Nations’ Cup together. We also did a few Saturday Night classes together and I thought she did great,” he concluded. Alex Granato of Wellington, FL and Carlchen W, a 2008 Mecklenburg gelding (Chacco-Blue x Continue) owned by Page Tredennick, captured a well-deserved win in the $25,000 TackNRider Grand Prix at ESP Spring II, besting a class of 41 entries. The pair finished a strong first round and proceeded to stop the jump-off timers in 37.211 seconds, six-tenths of a second faster than Emanuel Andrade of Wellington, FL and his own Dipssy. Kyle Dewar of Oconomowoc, WI and his own Clever van de Helle finished in third place. Granato and Carlchen W have steadily gained experience at the national levels before contesting their first FEI competition this past season at the Winter Equestrian Festival (WEF). The $10,000 Neue Schule Bits Open Stake was championed by Santiago Lambre of Wellington, FL and D’Artagnan, owned by Integrated Services Florida, LLC, after completing their jump-off round in 33.79 seconds at ESP Spring II to best the class. Benjamin Meredith of Wellington, FL and Rivierra, owned by The Rivierra Group, collected second place with a time of 34.888 seconds, while Emanuel Andrade of Wellington, FL and his own Dipssy rounded out the top three with a time of 36.336 seconds. The class featured 40 entries to start off the week of competition at ESP Spring II and hosted a large jump-off with 17 combinations contesting the short course. Nine of the seventeen pairs finished with a double clear effort on the day, while Lambre secured his win over Meredith with just over a second separating the two. The $5,000 Omega Alpha 1.35m Stake saw Emanuel Andrade of Wellington, FL and his own Tupac van de Rombautshoeve Z rise to the top of the competitive class, which saw 54 entries. The pair completed an efficient jump-off round in 34.202 seconds for the win ahead of Sharn Wordley of Citra, FL and Famoso D Ive Z, owned by Sky Group and Wordley, who completed their jump-off track in 34.601 seconds. Andrade followed his first place finish with a third place finish aboard his own Black Pearl, who stopped the jump-off timers in 35.019 seconds. Joseph Aman of Wellington, FL and Gentle Tina, owned by Diamante Altelier, rode to victory in the $1,500 NAL Child/Adult Jumper Classic, stopping the jump-off timers in 40.113 seconds. Julia Strawbridge of West Grove, PA and her own C’est La Vie secured second place with a time of 40.892 seconds, while Elizabeth Lang of Lake Forest, IL and her own Aramon took third place after adding four faults to their jump-off time of 43.443 seconds. Megan Davis of Cockeysville, MD and Deen, owned by Davis, rode to victory in the $2,500 Gold Coast Feed Low Junior/Amateur Owner Jumper Classic with a jump-off time of 38.478 seconds. Amanda Dollinger of Chicago, IL and Cupina Colada, owned by Dollinger, finished in second after stopping the jump-off timers in 40.407 seconds. Brooke Gunther of Chester Springs, PA and her own Wilford 2 secured third place with a time of 42.512 seconds. Sarah Kerins of Wellington, FL and Penelope Cruz, owned by Darragh Kerins, finished in first place in the $2,500 Equiline High Junior/Amateur Owner Classic after finishing their second round in a time of 41.143 seconds. Brian Sweeney of Oyster Bay, NY and Calvados, owned by Sagamore Farms, took second place as the only other combination to advance to the jump-off round. The pair finished in 44.283 seconds. Dagny Mactaggart of Millbrook, NY and her own Ziezo finished in third with 11 faults in the first round. The $1,500 Equine Couture & Tuff Rider Low Children’s/Adult Classic was championed by Heather Kuhl of Miami, FL and her own Wasserman, as the pair finished just a tenth of a second ahead of Ava Humphries and VDL Gottie W. Humphries of Highland Beach, FL and her own VDL Gottie W finished their jump-off round in 47.718 seconds. Sara Williamson of Wellington, FL and Pepie Lu, owned by Ossian Ventures LLC, secured third place with a second round time of 50.686 seconds. Zayna Rizvi of Greenwich, CT and Valdez, owned by Rachael Barnes, took home the blue ribbon in the $1,500 M&S Children’s/Adult Classic with a speedy jump-off time of 49.419 seconds. Julia Strawbridge of West Grove, PA and her own Charina, finished the class with six faults in the jump-off and a time of 53.478 seconds for second, while Rizvi also captured third aboard Forget Me Knot, owned by Peacock Ridge, LLC. The $1,500 USHJA Pony Hunter Derby saw Alexandra Lynn Willner of Boca Raton, FL and Blackout, owned by Cyrus Taraporevala, take first place with a two round score of 158. Lauren Gee of Valdosta, GA and Grand Slam, owned by Sweet Oak Farm, secured second place with a score of 156, while Sienna Pilla of Ridgefield, CT and Robin Hill’s Snapshot, owned by Piccolino Farm, LLC, received a 155 from the judging panel for third place. Tina Allen of New Canaan, CT and her own Galaxy championed the Adult Amateur Owner Hunter 3’6″ & 3’3″ Division, while Ellen Toon of South Salem, NY and her own Mirror Image took home reserve champion honors. The Green Hunter 3’6″ Division saw Katherine Newman of Wellington, FL and Dandelion, owned by Allwyn Court Inc., capture the divisional championship. Maria Rasmussen of Oak Creek, WI and With Honors, owned by Corporate Way LLC, rode to reserve. The Neue Schule Bits USHJA Hunter 2’3 & 2’6″ Division was won by Molly Sewell of Winter Park, FL and Big Light, owned by Carolyn Brown Capps. Samantha Shinn of Sarasota, FL and her own Quintos Z captured reserve champion honors for the efforts throughout the week. Adam Edgar of Leesburg, VA and Q-Pid, owned by Henk Punt, finished atop the division in the #1 Education Place Junior Hunter 3’3″ Division, while Madison Arani of Lexington, KY and Humor Me, owned by Ceil & Kenneth Wheeler, were presented with reserve honors. The Pilates Rocks Low Child/Adult Hunter Division saw Ashley Netzky of Chicago, IL guide Corporate, owned by Corporate Way, LLC, to the divisional title ahead of Christine Watkins of Rowaton, CT and her own Revelstoke, who were awarded with reserve champion. The ESP Spring Series continues with competition on Wednesday, April 19 with ESP Spring III. To see a full list of results and to learn more about PBIEC, please visit www.pbiec.com. Jose Roberto Reynoso and Azrael W. Photos ©Sportfot. Wellington, FL – April 11, 2017 – Jose Roberto Reynoso of Wellington, FL and Azrael W took top honors in the $35,000 Nutrena® Grand Prix at ESP Spring I, hosted at Palm Beach International Equestrian Center (PBIEC) to kick off the post Winter Equestrian Festival (WEF) season circuit. The duo completed the jump-off track in 35.263 seconds to take first place ahead of Margie Engle of Wellington, FL and Dicas, who crossed the timers in 36.579 seconds. Ailish Cunniffe of South Salem, NY and Baloucento 2 rode to third place, finishing just behind Engle with a time of 36.838 seconds. Reynoso and Azrael W, a 2005 Dutch Warmblood (Chin Chin x Voltaire) owned by Reynoso, rose to the top of the leaderboard after besting a nine-horse jump-off. Five pairs finished the day securing a double clear effort around both tracks. The pair finished a banner week of competition, after finishing in second place in the $25,000 Progressive Nutrition Grand Prix on Friday, just behind Laura Kraut and Deauville S, before their grand prix win. “I thought the course was good. He was just amazing, like always. I really like this horse so much. I’ve had him since he was four and we have a very good partnership together,” said Reynoso. The pair was the last to head into the International Ring during the jump-off for the class and Reynoso understood the challenge ahead. While several other riders had rails, he wanted to keep Azrael W careful, but also quick to ensure that the pair finished with the fastest time. “I was the last one in the jump-off and I knew that there were both four fault rounds and rounds with zero faults. I wanted to be careful not to have a rail and make sure that he stayed quick so that we could finish well,” he added. U.S. veteran rider Laura Kraut of Wellington, FL and Deauville S, a 2006 Holsteiner gelding (Diamant de Semilly x Lux Z) owned by Old Willow Farms LLC, rose to the top of a competitive first grand prix class during ESP Spring I. The pair dashed through the jump-off track in 38.626 seconds to secure the win. Jose Roberto Reynoso of Wellington, FL and Azrael W finished just behind Kraut with a time of 39.298 seconds for second place. Emanuel Andrade of Wellington, FL and Boy IV captured third place with a jump-off time of 39.298 seconds. Kraut and Deauville S bested the 33-horse class, which featured a small but fast jump-off of five horse and rider combinations. The seasoned pair of Kraut and Deauville S have competed around the globe and finished with one of their top placings this season in the grand prix. Jimmy Torano of Wellington, FL and Day Dream, a 2008 Dutch Warmblood gelding (Zento x Heartbreaker) owned by Jimmy & Danielle Torano, rode to victory in the $10,000 Nutrena® Open Stake to start off major prize money classes at ESP Spring I. The duo narrowly edged Sharn Wordley of Citra, FL and Caiman Des Sequoias, who stopped the timers in 37.69 seconds, while Emanuel Andrade of Wellington, FL piloted Boy IV to third place, finishing just a tenth of a second behind Wordley in 37.773 seconds. A total of 41 combinations contested the track, while seven combinations advanced to the jump-off round, including another two of Andrade’s mounts, Belita and Walter 61. Wordley also guided Rye Val de Mai to the jump-off as his second mount to contest the short course. The $5,000 Omega Alpha 1.35m Stake was championed by Luiz Francisco de Azevedo of Belgium and his own Axel P, rode to an efficient trip around the short course, finishing in 36.29 seconds. Emanuel Andrade of Wellington, FL and his own Tupac Van De captured second place with a jump-off time of 36.362 seconds. Andrade also picked up third place in the class, piloting his own Jenni’s Chance to a top three finish with a time of 36.599 seconds. Kelly Bauernschmidt of Bratenahl, OH and her own Belle Blue S rode to victory in the $1,500 NAL Child/Adult Jumper Classic after completing their jump-off trip in 37.376 seconds ahead of Nyah Chernoff of Dewinton, Alberta and Pater Noster, owned by Windemere Stables LTD., who took second with a time of 40.87 seconds. Serena Marron of New York, NY and Abnormaal, owned by Kevin Babington, earned third place after adding four faults to their jump-off time of 41.727 seconds. Kendra Gierkink of Harpswell, ME and Freestyler, owned by Kadley Holdings LLC, captured first place honors in the $2,500 Gold Coast Feed Low Junior/Amateur Owner Jumper Classic, finishing the class as the only pair to secure a double clear effort. Phoebe Alwine of Delray Beach, FL and Zenith Dance, owned by In The Clover Equestrian, earned second place after dropping a single rail, adding four faults to their time of 40.854 seconds. Michelle Navarro-Grau of Wellington, FL and her own Tibetano finished in third place, after accumulating four faults and crossing through the short course timers in 45.39 seconds. The $2,500 Equiline High Junior/Amateur Owner Jumper Classic saw Kira Kerkorian of Sagaponack, NY and Cassi, owned by Lisa Kerkorian, take first place, stopping the jump-off timers in 40.318 seconds. Kendra Gierkink of Harpswell, ME and Conisha van de Helle, owned by Kadley Holdings LLC, took home second place after finishing the track in 41.04 seconds. Michelle Naarro-Grau of Wellington, FL and her own Yidam finished in third place with a time of 42.02 seconds. Heather Kuhl of Miami, FL and her own Wasserman rose to the top of the class in the $1,500 Equine Couture/TuffRider Low Children’s Adult Classic after besting the four horse jump-off with the fastest four fault time. The pair finished in 38.665 seconds ahead of Matti Fisher of Westport, CT and Paloma, owned by Lionshare Farm, who lowered a single rail and finished in 42.042 seconds. Sydney Gorall of Wellington, FL and her own Askano, took home third place after completing the jump-off track in 44.851 seconds. Michelle Stacy of Marstons Mills, MA and her own Enqrique VHV took top honors in the $1,500 Marshall & Sterling Adult Jumper Classic after completing the short course in 35.237 seconds. Adrian Jay of Knoxville, TN and Bibi Sijgje, owned by Halle Fogel, placed in second after finishing the jump-off in 33.664 seconds and adding four faults to their score. Lia Screnci of Boca Raton, FL and Vichy, owned by Volado Farms, took third after dropping a single rail in the first round and finishing with a time of 72.494 seconds. Victoria Colvin of Loxahatchee, FL and Gabriel, owned by J T Farm, took top honors in the $5,000 USHJA National Hunter Derby during ESP Spring I with a total two round score of 177. Ericka Koscinski of Center Moriches, NY and Emerson Hill, owned by Libby Mewbourne, rode to second place with a final score of 172. Zayna Rizvi of Greenwich, CT and Verdana, owned by Laura Wasserman, finished in third place, only a point behind Koscinski, completing two rounds with a total of 171. Colvin and Gabriel received an 88 from the panel in round one before securing an 89 in the handy to take the win. The duo’s scores were the highest in both rounds, as they outpaced a class of 14 entries. Sienna Pilla of Ridgefield, CT and Robin Hill’s Snapshot, owned by Piccolino Farm LLC, championed the $1,500 USHJA Pony Hunter Derby with a two round score of 167. Hana Bieling of Wellington, FL guided Headlines, owned by Tanna Seltzer, to second place with a total score of 161, ahead of Christina Rogalny of Wellington, FL and More Like It, owned by Megan McCarthy, who took home third place with a score of 160 from the panel. The Neue Schule Bits USHJA Hunter 3′ Division saw Richard Fancher of Crestwood, KY and Von Dutch, owed by Cara Cheska, take the division championship ahead of Deborah Perkins of Wellington, FL and her own Rise and Shine, who secured reserve champion honors. Jennifer Hannan of Wakefield, RI and Canada, owned by Jennifer Smith, championed the Gold Coast Feed Performance Hunter 3’3″ & 3’6″ Combined Division ahead of Katherine Newman of Wellington, FL, who guided Forever Autumn, owned by Christine Richards, to reserve. Coco Fath of Fairfield, CT and Akinda, owned by Hillside Farm, LLC, secured the divisional championship in the #1 Education Place Junior Hunter 3’6″ Division, while Taylor St Jacques of Glen Allen, VA and her own Di Samorano were awarded with reserve champion. For more information on PBIEC and to see a full list of results from ESP Spring I, please visit www.pbiec.com. Francesca Damasceno and Watermill Time earn top honors in the $1,500 M&S Child Adult Classic. Wellington, FL – May 11, 2016 – German Camargo of Loxahatchee, FL piloted his own Centurio to victory in the $10,000 Open Stakes Class at ESP Spring IV, which was held in Van Kampen Covered Arena at Palm Beach International Equestrian Center (PBIEC). Camargo and Centurio took the class with a time of 41.792 seconds. Cesar Almeida of Wellington, FL, and Chaco 34 finished in second place in 42.795 seconds, while Michael Morrissey of Wellington, FL and La Lopez 3, rounded out the top three, crossing through the timers in 42.806 seconds. Competition continues with competition on Saturday, May 14, with the start of ESP Spring V, which concludes on Sunday, May 15. Francesca Damasceno of Palm Beach Gardens, FL and her own Watermill Time topped the $1,500 M&S Child Adult Classic, finishing the jump-off track in 24.19 seconds. Phoebe Alwine of Delray Beach, FL completed a banner day aboard her own Zenja, crossing the timers in 25.952 second for second place, and earned third aboard Zenith Dance in 26.224 seconds. Abbey Soffer of Palm Beach Gardens, FL earned dual championship awards in the Low Amateur Owner Jumper Division aboard Ghita, owned by Kobi Rhodes, and her own Lundback T Hastak. Perla Boord of Key Biscayne, FL piloted her own Rambo D to reserve honors. The THIS National Children’s Medal showcased a competitive division, as Christina Rogalny of Wellington, FL and Cool Boy, owned by Treesdale Farms, finished atop the class with a score of 83. Siena Vasan of Boca Raton, FL piloted Victurus te Salutat, owned by Carriage Hill Farm, to second place with a score of 79, and Noa Diener of Creek Village, FL finished in third aboard Jonny Boy, owned by Jimmy Torano. Samantha Harris of Stuart, FL and Ludger, owned by Becky Harris, topped the Ariat National Adult Medal with a score of 81. Fiamma Gonzalez-Perotti of Miami, FL and Consensus, owned by Equestrian Enterprises, Inc., finished just behind Harris with a score of 80 for second place. Marisa Tomassetti of Palm City, FL and Gerico, owned by Equus Show Horses, collected third place with a score of 71 to finish the afternoon. Competition at PBIEC continues on Saturday, May 14, with the start of ESP Spring V, which will conclude on Sunday, May 15. For more information and to see a full list of results, please visit www.pbiec.com. Wellington, Florida (May 2, 2016) – With the spectacular center arena of the Palm Beach International Equestrian Center set to host Grand Prix competition for the final time in the first half of 2016, a field of 43 horses and riders tested their mettle over an elaborate course designed by Mexico’s Catsy Cruz. Headlined by PonyUp Horse Treats, a producer of sustainably farmed, all natural treats, the class marked the concluding premier international competition for Wellington’s prestigious show grounds, running April 20-24, 2016. Victoria Colvin and the elegant dark bay mare Austria 2 combined speed and precision to put in a meticulous ride in both the first round and the jump-off, securing her the top spot in the PonyUp Horse Treats $30,000 Grand Prix. As one of only four double clears following the 11 horse jump-off, Colvin and the 2008 Holsteiner mare (Casall x U2 I), owned by Take the High Road, LLC, finished with a time of 33.174 seconds, with Angel Karolyi and Indiana 27 nipping at their heels with a 33.429. Margie Engle and Bockmanns Lazio raced to third in 34.288, while Frances Land and For Edition rounded out the double clear rounds in 38.062. Colvin and Austria 2 were the last combination to go, and the decorated hunter jumper rider had developed a feel for the course in earlier rounds aboard Echo Van T Spieveld and Chanel B 2. The typically fast mare benefitted from Colvin’s experience over the fences, and the pair found a winning balance of speed and synergy to top the class. Todd Minikus and Mark Bluman each put in quick rides in the jump off that would have bested Colvin’s, if not for single rails that dropped them out of the double clears. Victoria Colvin and Austria 2. ©Mancini Photos. Wellington, FL – April 25, 2016 – On the final day of competition at ESP Spring III, Victoria Colvin of Loxahatchee, FL earned top honors in the $30,000 PonyUp Horse Treats Grand Prix at Palm Beach International Equestrian Center (PBIEC) aboard Austria 2, owned by Take the High Road, LLC, as the duo finished with a time of 33.174 seconds. Angel Karolyi of Aiken, SC, and Indiana 27 secured second place crossing the timers in 33.429 seconds, while Margie Engle of Wellington, FL and Bockmanns Lazio collected third place with a strong finish in 34.288 seconds. 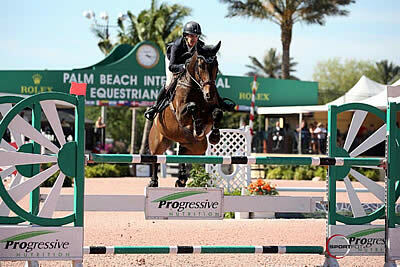 Competition at PBIEC will resume with ESP Spring IV beginning on Friday, May 6, and continuing through Sunday, May 8. German Camargo of Loxahatchee, FL and his own Centurio earned victory in a competitive $5,000 1.35m class at ESP Spring III with a time of 35.755 seconds. David Blake of Wellington, FL and Bella Donna, owned by Pine Hollow Farm, took second place, finishing in 37.411 seconds, while Denise Wilson of Ocala, FL and Alonso, owned by Neil Jones Equestrian, rounded out the top three, completing the track in 37.622 seconds. In the $1,500 NAL Child/Adult Jumper Classic presented by The Tackeria, Ally Marrinan of Saunderstown, RI and Ruby, owned by Rose Hill Farm, won the class, finishing in 36.528 seconds. Ella Bostwick of Wellington, FL and Bull Run’s Udamann, owned by Christine Bostwick, earned second place honors with a time of 38.245 seconds, while Maggie Alexander of Wellington, FL and her own Dukata collected third place crossing through the timers in 38.245 seconds. Anna Beth Athey of Enid, OK and her own Serena proved difficult to beat in the Low Amateur Owner Jumper division presented by Gold Coast Feed. The duo earned top finishes in two of the three classes composing the division, while Skylar Rogalny of Wellington, FL and Optimal Hastak, owned by Sweet Oak Farm, collected reserve honors. Switching disciplines, but continuing with her winning ways, Victoria Colvin of Loxahatchee, FL and Cacao, owned by Olivia Slocum, took victory in the $5,000 USHJA Hunter Classic at PBIEC with an overall score of 179.5. Colvin also picked up second place piloting With Me, owned by Victoria Colvin & Partners LLC, to a score of 179, for a small spread between first and second place. Robert Bielefeld of Wellington, FL and HH Himself, owned by Dr. Ana Lisa Carr, took third place with an overall score of 169. Madelyn Porter of Laude, MO and Dragonfly’s Encore, owned by Dragonfly Farms, secured first place in the $1,000 Junior/Amateur Owner 3’6″ Hunter Classic presented by Sweet Oak Farm and also picked up second place aboard Dragonfly’s Acerado. Kathryn Haefner of Hamburg, NY and Columbus, owned by Kathryn Haefner LLC, earned third place. In the $1,000 Junior/Amateur Owner 3’3″ Hunter Classic presented by Sweet Oak Farm, Amelia Ruth of New York, NY and Redeemed, owned by Katherine Mistick, finished atop the class. Kaitlin Porath of Charlotte, NC and O.C., owned by Meadow Hill Stables, collected second place honors, while Reid Arani of Lexington, KY and Samba, owned by Marigot Bay Farm LLC, finished in third place. Jennifer Hannan of Wakefield, RI rode to first and second place with in the $1,000 Pre-Green Incentive, earning first aboard Best Regards, owned by Patricia Fulchino, and second place with Soon to Be, owned by Jennifer Smith. Molly Sewell of Winter Park, FL and Dragonfly’s Cellestine finished in third place. Adam Edgar of Leesburg, VA and Land’s End Rondo, owned by Bill Schaub, championed the $500 Pony Hunter Classic presented by Forget Me Not Farm, while Samantha Palermo of Merritt Island, FL and her own Neptune, earned second place. Molly Deeks of Boca Raton, FL and Boca’s Tommy Terrific, owned by Ponies & Palms Show Stables LLC, rounded out the top three, finishing in third place. Sara Ballinger of Marion, OH and her own Wanderprinz finished earned the blue ribbon in the Ariat National Adult Medal over the weekend, while Samantha Harris of Stuart, FL and Ludger, owned by Becky Harris, earned second place. Jennifer Prior of Wellington, FL took third place aboard her own Lupicor II. In a competitive ASPCA Maclay Medal class at ESP Spring III, Hana Bieling of Wellington, FL and Renoir, owned by Mackenzie McGehee, topped the class of 18 entries. Catherine Stafford of Worthington, OH and Alando, owned by Victoria Hoft, took second place, while Olivia Woodson of Wellington, FL and Temptation, owned by Laura Macallister, finished third. Mark Bluman and Thriller P. ©Mancini Photos. Wellington, FL – April 22, 2016 – Mark Bluman of Medellín, Colombia and the newly acquired Thriller P, owned by Stransky’s Mission Farms, Inc., dashed to victory in the $10,000 Accuhorsemat Open Welcome Stake during ESP Spring III hosted at Palm Beach International Equestrian Center (PBIEC) with a time of 31.001 seconds. Victoria Colvin of Loxahatchee, FL and Don Juan finished in second place, crossing through the timers in 32.153 seconds, while David Blake of Wellington, FL and Park Lane earned third place with a time of 32.272. Competition at ESP Spring III will continue through the week and conclude on Sunday, April 24 with the $30,000 PonyUp Horse Treats Grand Prix. The course, designed by Catsy Cruz (MEX), saw 54 entries test the opening track, while 18 combinations moved forward to the jump-off round. Only seven pairs earned a double clear effort on the afternoon, while Bluman and Thriller P went later in the class order. Bluman and Thriller P, a 2004 Swedish Warmblood stallion (Cardento x Nelly P), are just getting to know each other, as he was recently purchased by Stransky’s Mission Farms, Inc. as a prospective mount for Daniela Stransky. Bluman also piloted his top mount, Califa LS, also owned by Stransky’s Mission Farm Inc., to an eighth place finish in the class. Thriller P, while new to competition in the United States, has an extensive FEI record in Europe, and will be a solid addition to the string of horses at Stransky’s Mission Farms, Inc. Bluman, who was not expecting to ride as fast as he did, was pleased with Thriller P and is excited for his future with Daniela. For more information on the ESP Spring Series and to see a full list of results, please visit www.pbiec.com. David Blake and Binkie. ©Mancini Photos. Wellington, FL – April 18, 2016 – David Blake of Wellington, FL and Binkie, owned by Pine Hollow Farm, finished atop the leaderboard in the $30,000 Noble Outfitters Grand Prix at Palm Beach International Equestrian Center (PBIEC), finishing the jump-off in 40.653 seconds. Andrew Ramsay of San Francisco, CA and Winn Winn collected second place, crossing through the timers just four-hundredths off the winning pace with a time of 40.699 seconds. Benjamin Meredith of Wellington, FL and Anabelle 28 earned third place finishing in 42.273 seconds. Competition at PBIEC resumes Wednesday, April 20, with the start of ESP Spring III, which will conclude on Sunday, April 24. The class boasted 44 starters who tested the first round track set by Ken Krome (USA), with sixteen entries moving forward to the jump-off round. Only the top three finishing combinations earned a double clear effort on afternoon, while Blake and Binkie collected their first grand prix win of the 2016 season. Blake and Binkie, a 2006 Dutch Warmblood gelding (Larino x Whisper B), finished a stellar 2015 season, capturing numerous wins at Tryon International Equestrian Center (TIEC) throughout their summer and fall campaign. The duo used a softer schedule during the winter circuit to prepare Binkie for another strong summer season. The duo’s set order in the jump-off proved to be a crucial component of their success, as they were the final combination to test the short course. Blake noted that Binkie’s large stride helped to cut time in several areas where leaving a stride out would be beneficial. Blake and the Pine Hollow Farm team will head back to TIEC at the conclusion of the fall circuit, and Blake is looking forward competing a string of talented young horses coming up behind Binkie. “We have three really nice horses that are about to move up to the FEI level and a new horse who we’re hoping will be able to back Binkie up nicely with the ranking classes this summer. It’s a great learning experience for them and Binkie will have a great supporting cast behind him looking towards the bigger events,” elaborated Blake. Alex Granato of Wellington, FL continued a strong weekend of competition, earning the win in the $5,000 1.35m Classic aboard Criss Cross, owned by Lorena O’Neill and Top Line Farm, LLC, with a time of 37.33. Benjamin Meredith finished in second aboard Karlotta Scott, owned by Sarah Ryan, with a time of 37.46 seconds, while David Blake and Park Lane rounded out the top three, finishing the jump-off in 39.87 seconds. The $1,500 NAL Child/Adult Jumper Classic was won by Francesca Damasceno of Palm Beach Gardens, FL aboard her own Watermill Time with a time of 36.416 seconds. Kamille Marcussen of Coraville, IA and her own Bull Run’s Pistol Pete finished in 36.587 seconds for second place. Phoebe Alwine of Delray Beach, FL and her own Zenja collected third place with a time of 36.807. Michelle Navarro-Grau of Wellington, FL and Tazman picked up division champion awards in the Low Junior/Amateur Owner Jumper division for their performance throughout the week, while Isabel Sanchez of West Palm Beach, FL and Euro, owned by Pursuit Farms LLC, collected reserve honors alongside Taylor Land of Alpharetta, GA and her own Dulricke Utica. Molly Sewell of Winter Park, FL and MTM Caruso S, owned by Brynn Hanson, finished the week with a the win in the $5,000 USHJA Hunter Classic, earning an overall score of 170.5 from the judging panel. Michael Zukerman of Huntington, NY piloted Denmark, owned by Patricia Adikes-Hill, to second place with a 164.5, while Katie Schell of Cleveland, OH and Candor, owned by Redfield Farm, took third place honors with a score of 159. Sewell earned an 83.5 in the first road aboard MTM Caruso S, and followed in the second round with an 87, to secure the win. Fifteen entries vied for top honors. Sewell also rode E. L. Raymond, owned by Leslie Campbell, to a sixth place finish. Coco Fath of Fairfield, CT and Akinda rode to the top of the $1,000 3’6″ Junior/Amateur Owner Hunter Classic presented by Sweet Oak Farm. Adam Edgar of Leesburg, VA and Candescence, owned by Clare Sargent, finished in second, while Madelyn Porter and Dragonfly’s Encore, owned by Dragonfly Farms, finished in third. Continuing with consistency throughout the week, Molly Sewell added another win at ESP Spring II in the $1,000 Pre-Green Incentive aboard Dragonfly’s Cellestine, owned by Dragonfly Farms. Taylor Kain of Boynton Beach, FL and Market Trend, owned by Daryl Ziegler Henning, earned second place, while Sewell picked up another top three finish, piloting Quentin, owned by Janice Cannizzo, to third place. Hannah Janson of Berkley, MA and Cascor’s Splendor, owned by Maria Moalli, topped a competitive division in the Pessoa/USEF Hunt Seat Medal presented by Randolph College. Dannie Murphy of Charlottetown, PE and Elmo, owned by Martie Murphy, finished in second, while Catherine Stafford of Worthington, OH and Alando, owned by Victoria Hoft, earned third. Competition at PBIEC resumes Wednesday, April 20, with the start of ESP Spring III, which will feature $10,000 Open Stakes Class presented by Accuhorsemat on Thursday, April 21, and the $30,000 PonyUp Horse Treats Grand Prix on Sunday, April 24. For more information on PBIEC and to see a full list of weekly results, please visit www.pbiec.com.